In the summer of 1829, Dr. Nathaniel Ward placed the chrysalis of an adult sphinx moth in an enclosed glass container so he could observe the moth’s emergence. The soil he placed in the container sprouted seeds and spores, as natural soils will do. He fully expected the germinated plants to die off in the airless container yet they grew and actually thrived in the atmosphere created inside the glass. The plants flourished because the moisture in the soil never evaporated in the closed environment. As he experimented with these captured gardens under glass, he found that humidity-loving tropical plants and ferns did especially well. His findings started a new trend. Decorative and ornate gardens in small glass fixtures became known as “wardian” cases. They became a popular fashion as well as a useful development. The glass boxes were used by plant hunters on far-away journeys to transport exotic plants back to collectors in England. In the Victorian home, they were small, indoor greenhouses used to protect ferns and delicate plants from the smoke and soot of coal furnaces and oil lamps. As is the Victorian way of beauty and opulence, flowers and other elements of elaborate decoration were added to these mini table-top conservatories. Air plants (Tillandsias) are ideal for these tiny terrariums. 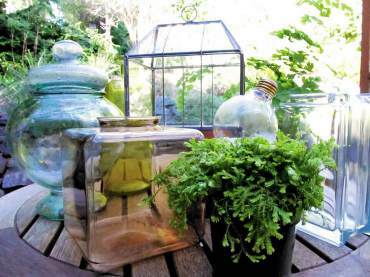 Terrariums of today are a modification of Nathaniel Ward’s glass cases. 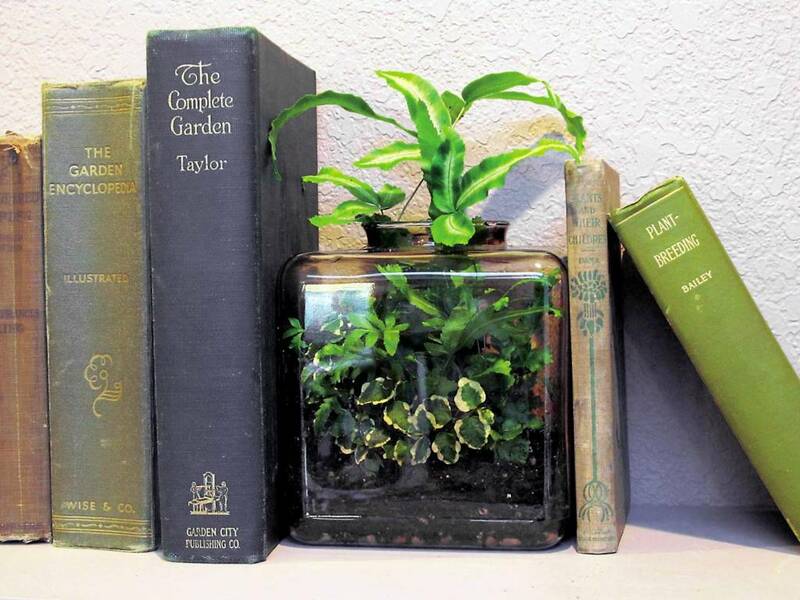 The basis of what Ward discovered combined with how they evolved for indoor decorating led to the modern day terrariums. Wipe away the visual of the 1970s foggy, glass aquariums filled with philodendrons. Terrariums are back and stylish for indoor decorating using all shapes and sizes of glass pieces. Check building reclaim stores for old glass globe light fixtures or second-hand stores for unusual glass jars. The shape and style of the piece can set a mood and add an easy-care, indoor living garden to any décor. Planting begins at the bottom of the jar. Glass terrariums have no way to drain water and one vital aspect of a successful terrarium is a drainage layer. It helps the garden maintain a proper environmental balance. Place a 2-inch layer of small rock (the size of the stones needs to be an inch or less in diameter) in the bottom of the container. Use aquarium rock, polished stone or tumbled sea glass to add a decorative effect. Level the layer across the bottom and spread a thin layer of horticultural or activated charcoal on the top of the stone. The rock layer will provide a place for excess water to go without exposing the plant roots to prolonged soggy soil and the charcoal will help keep the soil “sweet” by absorbing decaying matter. Place a layer of fresh potting soil on top of the rock/charcoal drainage layer. Fill the terrarium structure with about a third of soil. Add plants and arrange them artfully. 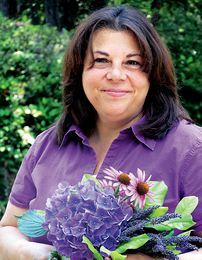 Choose low-growing, small plants that like humidity and low light. Balance the size of the plants to the size and shape of the container. Native woodland plants like ferns and mosses appreciate the terrarium environment. Use elegant, tall and narrow glass vases for orchids to show them off and create the humid environment they love. 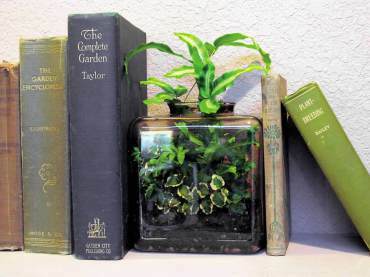 Cultivated miniature houseplants such as African violets, mini begonias and other slow-growing leafy houseplants need no special attention to do well in the terrarium environment. Add decorative touches with rock, sea shells, miniatures or pieces of wood to create a tiny landscape. Water the terrarium very gently and sparingly. If the soil is very moist when initially planted, no extra water is needed. For terrariums with a lid, avoid condensation buildup by removing the cover for a few days to allow some of the moisture to evaporate. The balance of air and moisture should keep the terrarium self-supporting. Keep it away from direct sunlight to avoid heat buildup inside. As the plants mature, keep dead leaves and debris removed. Prune and trim plants as needed to keep the balance of the design in the terrarium. If the glass terrarium fixture is too shallow for a soil layer, add a layer of decorative rock and place plants and soil in small decorative pots buried in the rock. Air plants or Tillandsias have become popular in terrarium design because they can be planted in rock or sand and do not need drainage, a soil layer or water to thrive. 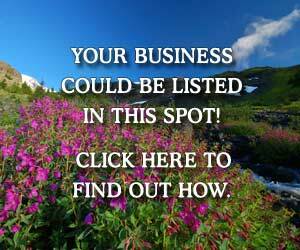 Look for clear glass globe light bulbs, typically used for bathroom vanity light fixtures. 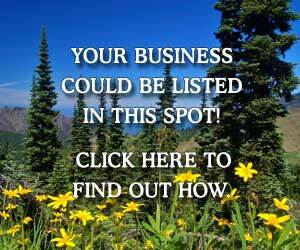 They are usually inexpensive at reclaim stores such as Habitat for Humanity. Tools: Needle nose pliers, safety glasses, gloves, a flat screwdriver and a bamboo skewer, funnel. 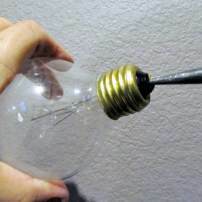 Carefully lift the small, thin metal end on screw end of the bulb. It can easily be pried up with pliers (or the thin flat part of the screwdriver.) Grab it firmly and pull straight out. Carefully remove the black glass; it will break into bits, so wear safety glasses and gloves. Hold it carefully over a garbage can to avoid small bits of glass scattering everywhere. It will take a bit of force to snap it but it is fairly easy once it cracks. Remove all bits of black glass from the rim. 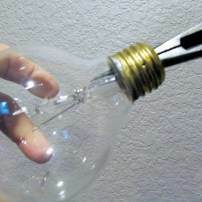 You can now reach the inside filaments of the bulb. Use pliers (or screwdriver) to break and pry them loose. 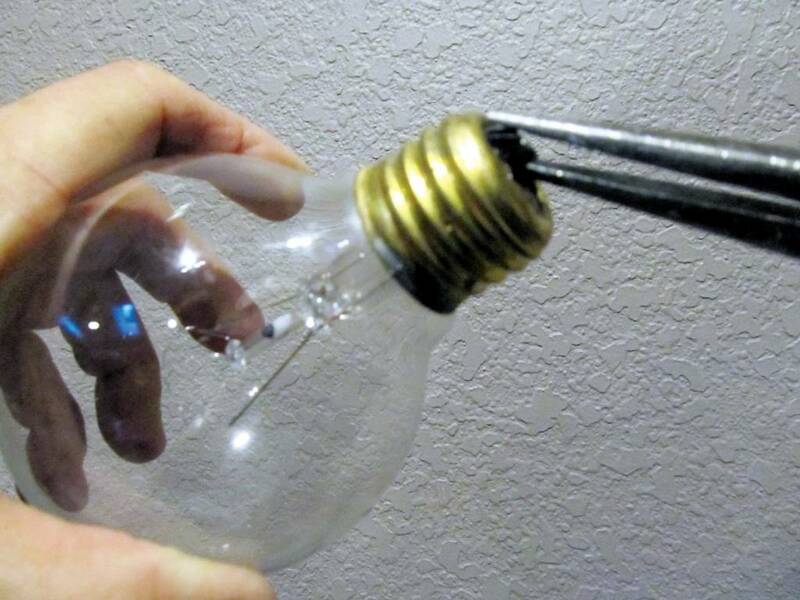 Hold the bulb firmly and use caution with tiny bits of glass and wires. Clean all the interior pieces out. Rinse and allow to completely dry. 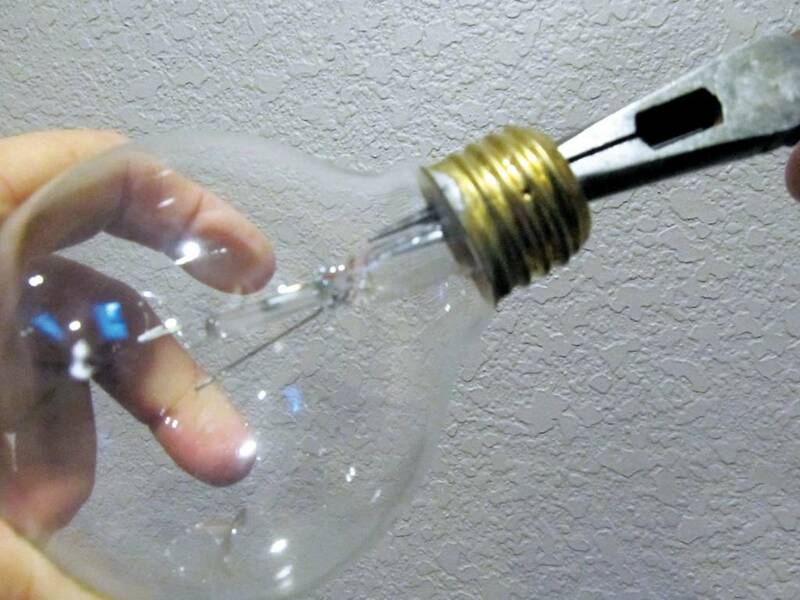 Create a stand by adding small dots of clear silicone to make a base that keeps the bulb from tipping over. 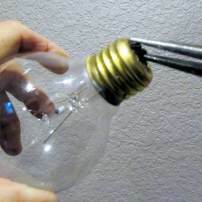 With a funnel, add a layer of clean sand to the bottom of the bulb. Add tiny bits of moss. Add tiny seashells or other décor to create a mini landscape. 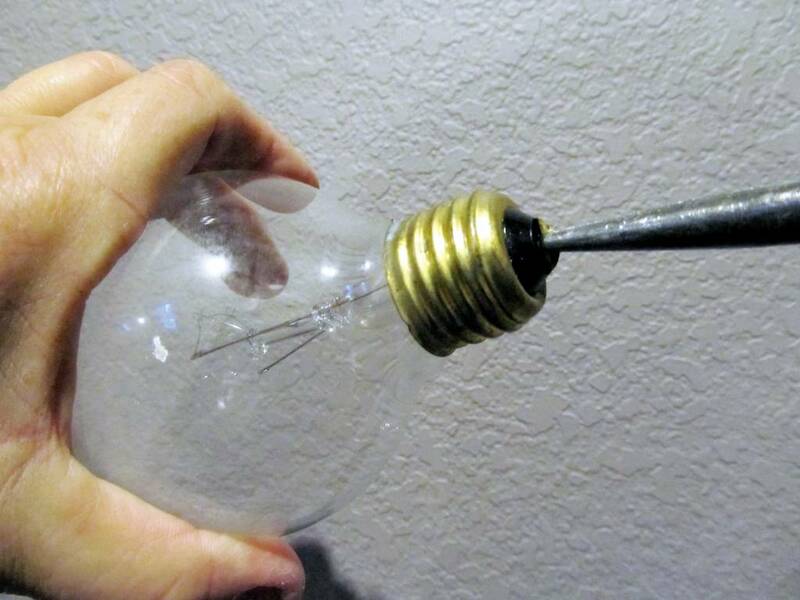 Use the bamboo skewer to arrange pieces inside the bulb. 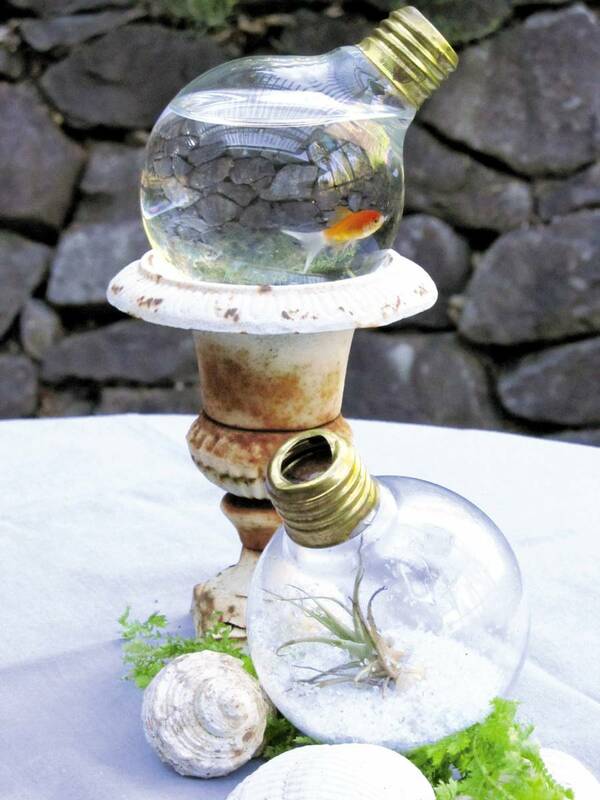 Gently push the narrow end (the base of the plant) of the Tillandsia into the light bulb and arrange it into the sand and moss.